I’d love to get a black panel made for a mangrove. Material isn’t important, it could be acrylic or whatever. This is pure vanity, obviously Every module in my case is black and I’m trying to keep a cool thing going. I know that there are people online who make custom panels, but given that I don’t have precision measurement equipment and I only want one panel made, that seems a bit out of reach. 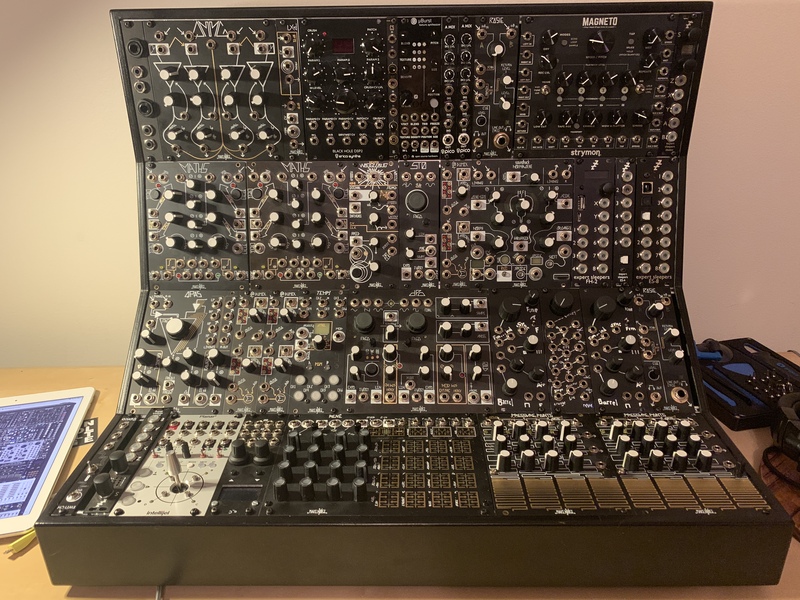 I reckon you should reach out to some of the smaller one-man operations who specialise in music-related/modular panels. You could probably send them the original panel (you’re going to need to remove it anyway!) to work off so you don’t have to do any measurements yourself. There are bigger online operations such as Schaeffer (they’re Front Panel Express in the USA) but for those you need to know the exact dimensions and layout the panel yourself. Also, not particularly cheap (certainly for one-offs) depending on the options you choose. My experience has been that smaller setups tend to be cheaper. I’ve included a link below for “the beast” who is based in the UK although I am sure there are plenty of similar services in the USA if that’s where you reside. I would begin this journey by asking the original module manufacturer / panel designer some kind of .pdf / .ai file for the panel ; I’ve had very nice replies for such queries from various manufacturers. Also : if you go for PMMA (acrylic), be sure to check the panel thickness. Most of the time PMMA panels are around 3 mm thick, which is too thick for many jacks and other electromechanical components used by Eurorack module manufacturers, as most Eurorack panels are made out of 1.5 to 2 mm thick aluminum or laminates. People making PMMA Eurorack panels usually use 3 mm thickness because thinner panels tend to bend when inserting jacks or even turning potentiometers. Though sometimes thinner panels work all right, especially when most / all electromechanical components are soldered to the PCB. I’d be curious to know which manufacturers shared their panel templates with you and for which modules? This is going to be an incomplete reply, since I won’t have access to the hard drive where I have all this info before next monday. I will add to this list when I have access to the files. Ahh very cool! Would definitely love to see the list if you ever get around to it. Also wondering if you’d be willing to share the templates. I understand if not. I ended up ordering defective panels from Whimsical. I painted them myself. They look janky, but given the existence of Uoki-Toki, it’s not horribly bizarre looking. Sorry for the late reply, I thought I could make it last week but, as they say, “life got in the way”. Tell me if you’re interested by any of theses templates, I will gladly send the files via PM (as to not derail this thread too much). Interested in them all if that’s ok.
Oscillosaurus makes a lot of good-looking black alternative panels. I wonder if they could be convinced to design some for the Whimsical Raps line. My Whimsical modules are currently the only section in my portable case that isn’t blacked out. Full disclosure, I’m not associated with them business-wise, other than much of the panel & system photography displayed on their site is mine. I asked Bryan of BKM Panels about this and it sounds like he is already working on black panels for Mangrove, Three Sisters, and Just Friends. I started drafting a black-and-gold Cold Mac a few weeks ago but never got around to finishing it. Guess that’s one less thing to work on now since he’s already on it. @caelmore Oh nice! Do you happen to have a template of the panel for Cold Mac? Still missing that one. I am Bryan of BKM Panels btw. Would love it if you’re willing to share the drill locations/template with me. I’ve also started a project on github to consolidate and list as many modular panel templates as possible. I only recently started it and have been adding more templates as I have time, but the project is there, it’s open source and anyone is able to help grow the collection if they wish to help. @brndnwilliams Totally understandable, the design isn’t for everyone and I fully expected that going into it That being said, I a happy to help you get started on designing your own custom panel if you want. This is part of the reason for starting the github panel template collection, to help other DIY’ers out there or anyone looking to create a new design. Module companies are starting to jump on board the black panel as well and are seemingly shifting toward offering both options which is rad. Oh nice! Do you happen to have a template of the panel for Cold Mac? Still missing that one. I don’t. I had started a mockup in Illustrator with the intention of importing and modifying it in a PCB design program with some help once I finally have one of my own to reference. @caelmore Ok gotcha, thanks for the reply. Cold Mac is on my wishlist for my personal rack when that time comes or if someone else is able to share the panel before that I will add it to the github repo of panels. I am currently using KiCad for creating PCB’s for panels and it’s been working out really well. Free too! Sources for the Mannequins Eurorack module panels. Contribute to whimsicalraps/MannequinsPanels development by creating an account on GitHub. And to everyone else, I’m down to buy black versions of these panels if anyone makes them. I have a JF, too, that I held off on attempting to DIY due to the detail on the lettering. And my Cold Mac definitely suffers from my illegible attempts at coding the jacks with my thick, white-out-looking hieroglyphics.